Kansas, Oklahoma, Texas, and Colorado have all been hit by wildfires with at least six people dead. Fires have continued to burn and farmers have compared the wildfire damage to what was caused by Hurricane Katrina. Gary Joiner, Texas Farm Bureau, said it was the worst wildfire season in 11 years. “People have died. Many thousands of head of livestock have been lost. A major agricultural disaster has been left behind,” he said. Kansas Senator Pat Roberts told the Senate of a 40 foot ‘wall of fire’ which had destroyed a friend’s ranch. “We have unimaginable damage to land and property but also heart-wrenching scenes of cattle and wildlife burned, wounded and wandering,” he said. But the US farming community has come together to tackle the challenges faced by affected farmers, providing feed, hay and fencing materials. “Hay deliveries to the Panhandle arrived in large numbers. Cattle have been donated to auction markets to raise money for disaster relief funds and farmers have been bringing hay, milk replacer and fence work from across the states. The US Department of Agriculture (USDA) has also allocated $6 million to help farmers and ranchers affected by the wildfires. Mr Roberts said the cleanup was now underway. “We have families who have lost the farmhouse and all of the equipment they need to rebuild. 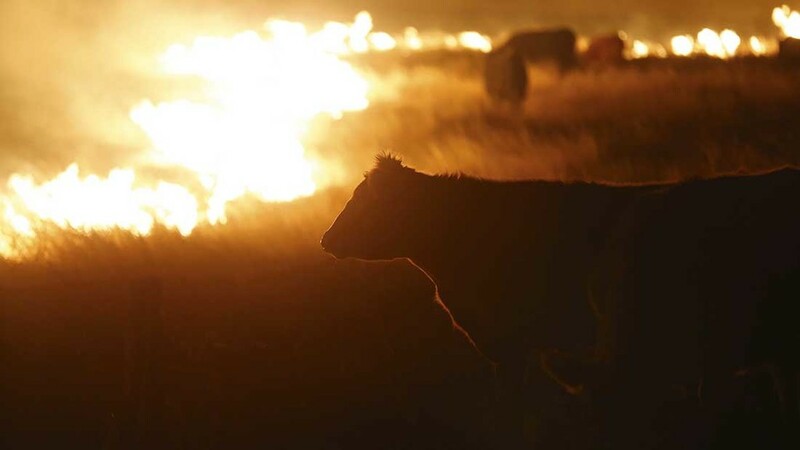 Many livestock producers have had the gruesome task of euthanizing cattle that have been badly burned,” he said. He added there was now uncertainty over when there would be rainfall and how long it would take grass to regrow.